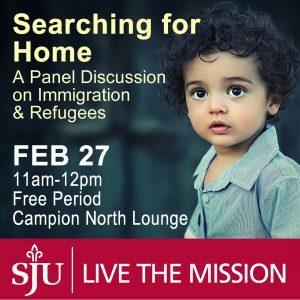 As part of the University’s Mission Week celebration, the SJU Refugee Working Group and SJU Common Grounds are co-sponsoring an information session on Tuesday, Feb. 27th, 11:00am-12:00pm, in Campion North Lounge. Panelists will include scholars, as well as current and former students, who will provide background on the issues of immigration and refugees, as well as share information about their personal experiences working with immigrant and refugee populations. There is a follow-up event–a dialogue session to be moderated by Commons Grounds–on Thursday, Mar. 1st., at 7:30pm in the Campion Sun Room 1, where participants will have the opportunity to discuss these issues in a welcoming learning environment. Everyone is welcome!